Last week my parents came up for a visit. Mom and I looked for fabric for the baby’s room. Daddy and Paul played golf. 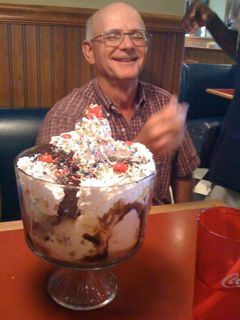 But the highlight of the visit was on the last night when we went to eat at Mayberry’s. English walnuts, and ice cream cone hat. …..oh yeah, there is a cherry on top. He decides this would be a great thing for four people and a baby to try to consume. So, of course, the rest of us jump of his band wagon. The ice cream part of the restaurant is at the front, and we are at the back, away from everyone else in the place. 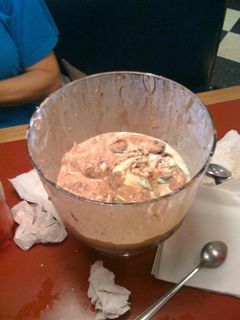 I look over and see the waiter pull out a trifle bowl and begin to put our 12 scoops of ice cream into it! A TRIFLE BOWL! We all move from unbelief at what we have just done to uncontrollable laughter as the everyone in the restaurant is watching the guy make this thing. As he brings it to our table, heads turn to follow him and our laughter increases. This is what the Lock Stock and Barrel looks like and this is my dad – the man who did not want any ice cream 10 minutes before this picture was taken. 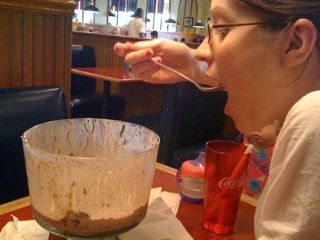 My mom…she and I finished the thing off. Out of my mom and I, of course, I am the last one eating. I blame the pregnancy. 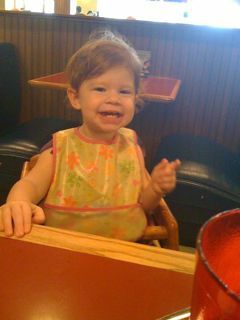 Lily was happy, full, and on a sugar high by the time we left. 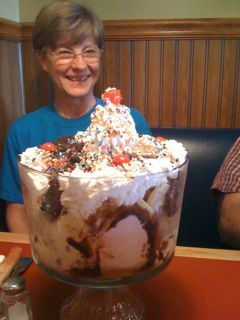 Oh, and on the way out a group of ladies stopped us to ask if we finished it. Fun times with the folks.